Stepping into Brownsville Middle School, I didn’t know what to expect to be honest. 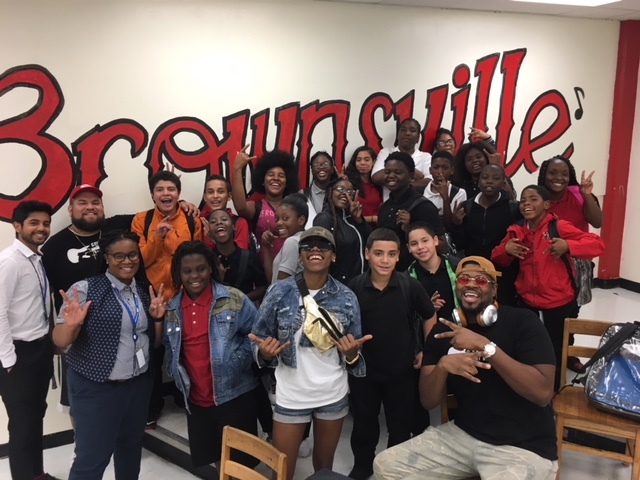 When I was asked to change from Georgia Jones-Ayers Middle School in Allapattah, I was a bit hesitant, not because of what I had heard about Brownsville, but simply because I was very attached to the culture we have at Georgia Jones. Brownsville has had a bad stigma, known as a school with bullies, gangs and negligent teachers and staff. As we started the school year, we were told that they were in the midst of change throughout all staff including new teachers and a new principal. This particular change has included a new culture – a new vibe to the school if you will. Alongside its other after-school programs (Allstars & Girl Power), Guitars Over Guns comes in to fit like the glass slipper for Cinderella, filling a vacant area the school had yet to offer. In our first couple weeks, the kids were a bit skeptical but still willing to hear us out. Bullying was one of the first things we established as something unacceptable in this musical environment, a message we wanted them to carry out during the school year. One example was one of our 6th graders, who was being picked on right in front of me and who within seconds ran out of the classroom crying. When approached, she kept saying she didn’t want to participate, let alone be there. That’s when Mr. Devakonda (a 6th-grade math teacher at Brownsville) and myself told her this was not right and that we didn’t want her to leave but wanted her to stay. She agreed to stay and was a bit shy in her return, until I asked her who was her favorite singer or song. She replied with Whitney Houston’s “Greatest Love of All” and began to sing it for everyone in the room. Very fierce and with no fear, she finished the song and said, “That’s what I like.” The surrounding students clapped for her and you could see it made her feel good. The point of the story is we cannot give up on these kids; we must provide them with all we can to better their situation through the power of music. Join our email list and stay up-to-date with our latest events and news. Your gift will help a young leader in our community reach their full potential!